To begin with, I have a confession to make. I was never a fan of Sideburn. I have, of course, known about this band for many years now, both them and me being Swedish. Even though I never thought that they were bad, nothing in their music really stuck with me. It was very much in one ear, out the other, despite the fact that they guys are all really good musicians. This has always been a bit of a thorn in my side because – and here’s another confession – I know their guitar player Morgan Zocek. Now, who in the right mind wants to tell their friends that they don’t like their music? Well, luckily enough, that subject hasn’t come up at all when we have met so I guess I have managed to get out of that one. Until a day some three years ago when I got an e-mail from Morgan, asking if I would be interested in reviewing their then new album, IV Monument. Damn! Well, how could I say no? I accepted and got to work, keeping my fingers crossed that I would find something there that stood out, so I didn’t have to write it down. Because here’s the deal, when it comes to my reviews, I don’t play ball. Because, even if I could give away extra points to friends records without anyone knowing about it, I would know about it and when it comes to music, I can only see it one way: It’s all about integrity, no matter if you write songs, plays music or write about music, gigs and records. Make a bad album and I’m gonna say so, no matter how much I like the persons in question. Play a bad gig and that’s what I ‘m gonna say in my review – and that will never be under any discussion. That said, so far I have been very lucky in that department. Apparently, I have some very talented friends and apparently I share musical taste with many of them. Because yes – confession number three – I do know some of the people whose bands I review, I won’t deny that. 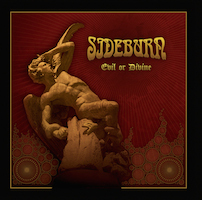 Anyway, Sideburn’s last album really took me by surprise because that album was everything their prior releases were not – it had great songs that were catchy in both their heavy riffing and their melodies and the fact that the album sported a big Tony Martin-era Black Sabbath feel didn’t exactly make things worse. I love that era of Sabbath. What brought that change, I’m clueless of. Change might be the wrong word here because musically, they hadn’t changed that much at all, it was just that everything had gotten better – songs, arrangements, melodies. Which brings us to their new album. Sideburn’s world has been somewhat dysfunctional after that release. Their great lead singer Jani Kataja jumped the ship and was last seen on 80’s retro metal band The Dagger a year ago. It was a bit of a shock, why leave when the band is better than ever? Morgan and the two other guys – Martin Karlsson (bass, organ) and Fredrik Haake (drums) – wasted little time in finding the replacement, Dimitri Keiski, a singer who also plays guitar. I really good choice, I might add. Dimitri became known to the Swedish audience when he won the contest True Talent a few years back. However, that contest didn’t become a big success so nothing really came out of it. But I was very impressed with him and I hoped that we would somehow see more of him later. And so we did. I was very curious to hear what he might come up with in Sideburn and how he would fit that band. Again, I kept my fingers crossed. Maybe their last album was just a lucky shot and I have to slip this one the big chainsaw. I push play and let the opener “Master And Slaves” burst through my headphones. I breathe a sigh after the first half of the song because by the sounds of this one, I have nothing to worry about at all. They have kept the Tony Martin-era Sabbath influences which suits me fine and I can also state that Keiski fits this band like a glove, although I really had no worries about that. “Sea Of Sins” takes us back to the back alleys of the 70’s where heaviness and groove built a solid base for hard rock music. I bet this one will be a killer live. I’m back in 1970 for a while with the song “When Darkness Calls” and I’m thinking that this could be a cover of a lost Sabbath song, written for their debut. But the song is over 6 minutes long and in there, John Norum’s guitar sound from Europe’s debut album (1983) shows up – what a brilliant move. Also, the song speeds up towards the end which brings variation to the track. Brilliant six minutes! Tony Martin’s Black Sabbath returns in “The Seer (Angel Of Death)”. It’s a slow and bluesy doom number and the key melody is very catchy. “The Day The Sun Dies” is one of my favourites here. Think Black Sabbath, the way they sounded on their first album, playing Alice Cooper’s “Dead Babies” with Tony Iommi’s riffing all over it. Then add just a tiny bit of Candlemass and you’re pretty much there – fantastic! “Evil Ways” is more straight forward, still nursed in the 70’s, but this time catchy and an almost hitty refrain. They end the album with a big, fat, epic rock ballad, the way bands such as Black Sabbath and Led Zeppelin did ballads back when. No matter how hard you try, you won’t ever find any cheese there. But the melody is quite striking and memorable. Only seven songs might look quite cheap, but hey, remember what albums looked like in the seventies, back when there was only vinyl and no CD or mp3? Seven or eight songs wasn’t unusual at all and this album clocks in at 44 minutes so there are lots of music worth on this album anyway. Besides, I think it’s great that more and more bands decides on not overdoing it anymore. 10 songs are enough, really, but I’m ok with 12 as well. More than that is overkill. So, the seven songs on this album isn’t cheap at all, quite the contrary, there are lots and lots to digest here. Is this album better than the last one, then? I’m not sure as it differs some style wise, this is darker and more doomy, but it’s easily as good. The song writing is intact and it feels like Sideburn has finally found their way, how to combine a really heavy foundation with really good songs, great melodies that are really catchy without it ever going hit-rock. Also, Dimitri Keiski is a real find, I must say. Remembering the way he acted on True Talent, the guy just might work wonders for this band live as well – not to cast a shadow over Kataja at all. But Keiski is a really good frontman with lots of attitude and charisma and his cool looks might just attract a larger female audience in this male dominant genre. It’s gonna be really exciting to hear the old songs performed by Keiski. So, for all fans of really heavy rock music, for all people who loves their 70’s records with Sabbath, Zeppelin, Purple and the rest of them, do not miss out on this record. Me, I just can’t stop playing this damn record!